This was first written on the one year anniversary of my dad’s death. Time is so weird. It’s hard to believe it’s been two years and at times it seems he’s been gone much longer. As I stood watching this father and son bless Dad, I thought I knew how my dad’s generosity over the years to people was coming back to him and to us. Here’s a truth people have said, but maybe not in the clearest of terms. Let me flat our say it. When you die, your “stuff” comes out. Who you really were will be known. Not who you presented or hoped people would know, your secrets will see the light of day. You may be dead, but what you’ve left will be gone through. You will be known in a way you couldn’t be when you were alive because you are no longer your main PR guy or gal. You think people won’t know about this or that. Ha! They will. When people have gone through your finances, the ways you invested your time, the type of relationships you fostered, the way you did your job day after day, week after week, year after year, what will be said of you? If you summarized your whole life in one word, what would it be? Those of you who had the pleasure of knowing him are nodding. Yup, he was a generous guy. Well, I am here to tell you, you have no idea how generous, because I had no idea how generous and he raised me for Pete’s sake! At the time of his death we were surprised to find out he had volunteered about 700 hours at The Action Center, helping people foster self-sufficiency. We knew he’d volunteered, but 700 hours?! Sure, you might be saying like I did, after he retired he had the time to give. But this is what I’ve come to believe the past year as we’ve slowly dismantled parts of his life, it’s not about having the time or the resources, it’s about habits. I have been stunned and humbled and proud as I’ve sorted through what I mistook to be his legacy: all the dang paper he left. I’ve shared before, but the man never met a piece of paper he didn’t want to keep forever and ever amen. But were it not for all those boxes and piles and bags of paper stored here and there, I wouldn’t know what I know. He gave hours and hours while working a full time job. It is hard not to speak in hyperbole, not because this is my dad I’m talking about, but because of the magnitude of the time he gave. I have gone through files representing years worth of being on the mission committee complete with the prayers notes he took and the financial investment the church made. There’s also serving as an elder and helping his aging aunts and uncles and helping this person or that one. I could go on. But his generosity wasn’t just with his time, it was also with finances. We found a cancelled check from a time where money was very, very tight. He’d written a note saying it had been a hard year with health and business crises but that he and Mom believed in the cause and wanted to honor the commitment they had made. When I came across the first time he chose sharing money with others when he could have reasonably kept it, I thought it was kind. Anyone can be kind on occasion, right? What do you start to make of the third or fifth time? It’s wrong to think he was just generous nearer the end of his days when finances weren’t such a pressure. It’s easy to point to abundance and confuse it with generosity. What he had was value and habit and a true love of people. His love of people comes through in the rough drafts he left behind. We unearthed three letters he wrote to his first granddaughter on, it seems her first and second birthday and the ways she’d enhanced his life. Just last week I found notes he’d taken to share at friend’s retirement party – the details and funny stories showed a generosity of noticing, really noticing. I’ve thrown away newspaper cuttings from the 1960s about his boss who died unexpectedly. Dad moved that clipping from job to job for the next 40 plus years. This memory epitomizes Tom Young. Don’t focus on the wrong things, the things that will fade. Instead, live out of patterns that aren’t tossed by the whims of conditions. We are told to do our good deeds in private lest anyone should boast. And this is right and good. The only down side to it is that by doing so, sometimes we forget we are capable of more than we might imagine. I cannot imagine how devastating it would have been to discover Dad had complicated secrets, addictions we didn’t know of, or debts sprinkled here and there. I’ll be honest that in the past year, each of us has seen someone of Dad we hadn’t before. You can’t know everything. But what a sweet gift he gave to us that this year we have seen he was who we thought he was. On this one-year anniversary of the last day I held my dad’s hand, I ask myself if there are habits I need to change? Are there some I want to foster more? Are there some I want to walk away from because of the ways they are forming me? 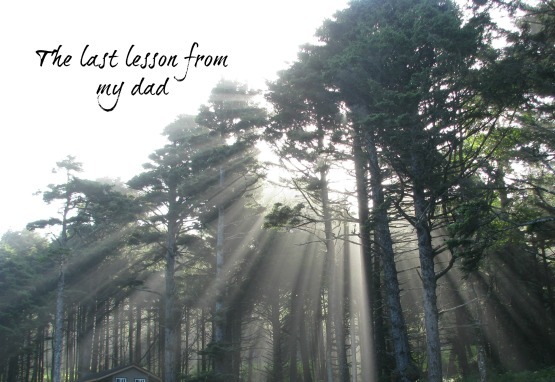 Dad, I am grateful that in death you continue to influence and shape me. As you know, but I will never weary of saying, I love you. Amy, I’m proud of you for paying attention to the details. There are many that would not have taken the opportunity in the sorting for anything other than a cursory look to determine whether the document or memento is a “toss” or a “keeper”. God blesses the sorters that have a seeker’s heart. You are a dear heart.